What a week! Have had to 'dress up' for a few days which takes me out of my comfort zone. 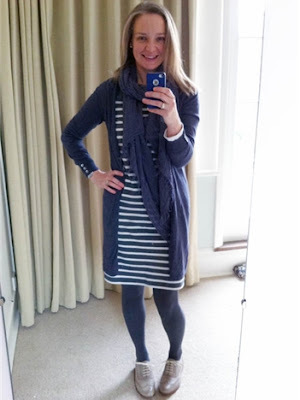 I have slipped into a skinny jean/knee high boots rut over the past 18 months and so to dress for a meeting or event has me shivering because it means no jeans - but I threw that rule book out the window and wore smart dark blue jeans and a blazer on Thursday. I am envious of those that can pull off smart casual chic - I just don't ever feel that comfortable in it. That said, I did feel good on Thursday with the cream blazer, dark jeans look. However, it was not warm and I was outside for hours (not even my thermal vest could protect me from the SPRING elements). My comfort zone ... 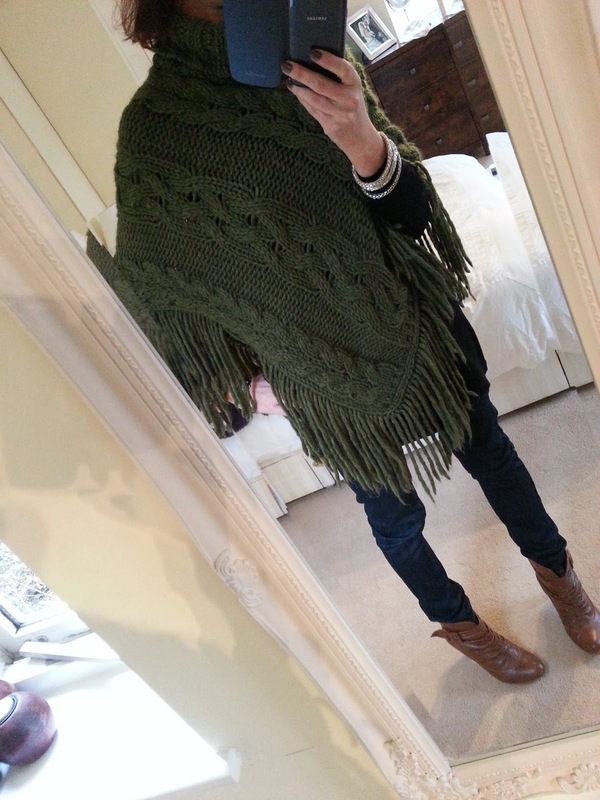 I do love a good chunky knit! Have never worn leather trousers in the day before but Kat from Does My Bum Look 40 showed me the light earlier in the week, so I just copied her blatantly! 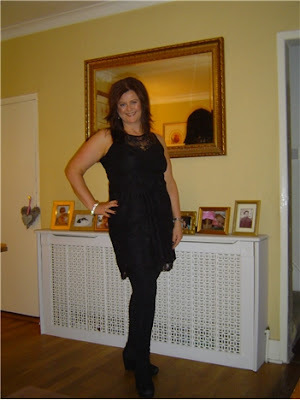 My lovely outfit for a styling event I was helping out at locally. Shoes were bloody uncomfortable after running around so changed mid afternoon for flats. 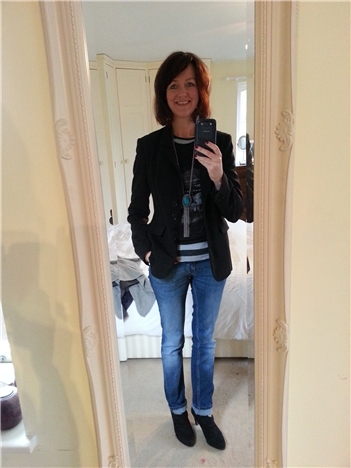 A touch of the Sue Perkins for this - a black blazer always makes me feel like her! No-one I know ... NO-ONE pulls off the denim shirt look in such style. I have a little girl crush on this gorgeous lady and I want her whole wardrobe. What takes you out of your comfort zone ... or don't you ever leave it? 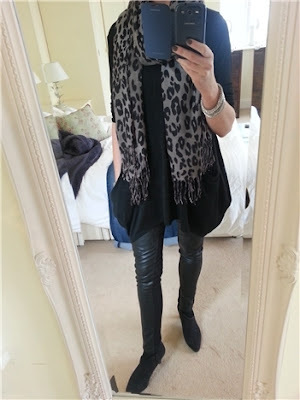 How fab are the pleather trousers for during the day? I love them. May get then out again this week..... And you look absolutely nothing like Sue Perkins you utter fruit loop. Love love love those blue jeans of yours such a perfect shade. 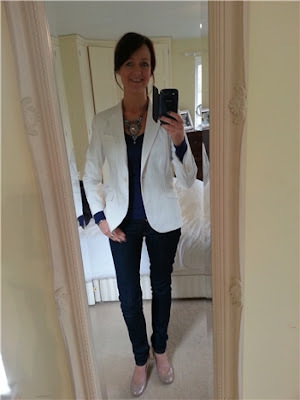 I need to get a white blazer you look gorgeous in yours Fiona! 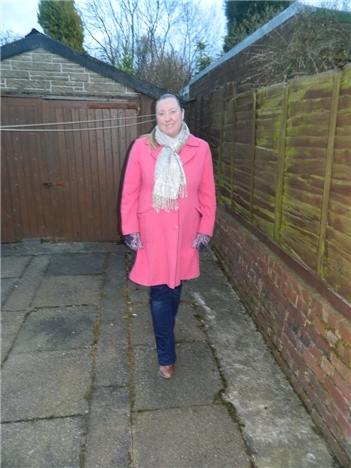 And meant to say you look fab in your smart casual look! It's my personal fave fave look - I now have so many elements in my wardrobe that I can just throw on, it becomes such an easy option. 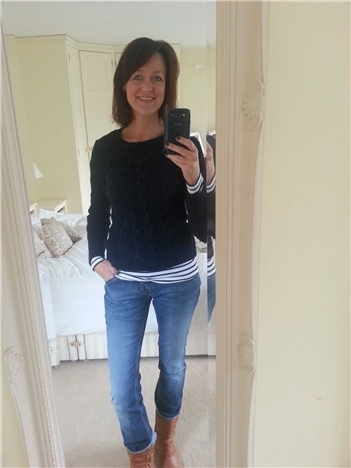 Plus easy to super dress up for a night out or dress down with a pair of hi tops. I can't do the hi tops yet - remember the Run DMC days back in the 80s ..
Hi there-some very inspiring outfits here, loving the pleather trousers and also your blazer and jeans too-its such a stylish look. thank you! 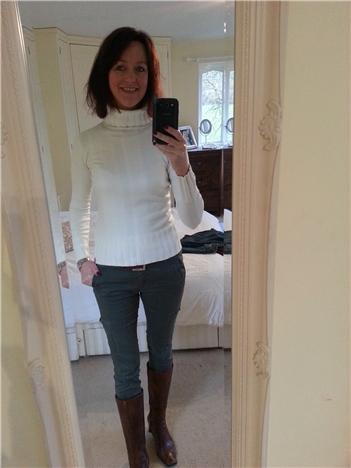 Not sure the pleather trousers would make a school run day but for lunch at the weekend when dumbed down with a sweater they worked a treat! Have to say, I'm with the other girls - I like the look of the pleather trousers for a daytime look. Scares me to say it but I think (used in a very loose non commital way), I might actually like a pair! Oh bugger! I now want a white blazer .. AND a pair of pleather skinnies. As Avril would say, 'le sigh'!! You MUST get some pleather jeans - they are great for all occasions now I know I can wear them during the day! My blazer is cream with a very fine grey pinstripe. I can't wear skirts well .. I just look frumpy but I am determined to wear more once the weather heats up! Can grown women wear dungarees? I'll tell you what I want ..